After the shock of the initial miniseries, the show quickly catapulted viewers into a life or death extended chase sequence. Viewers of this year's The Last Jedi will instantly see the parallels: The Colonial fleet is being pursued by the Cylons, forcing them to use their FTL drives to continually jump. The problem is that this process occurs every 33 minutes, leaving the fleet's fighter pilots strung out and the remaining human population suspicious of one another. This is an excellent introductory episode because it encapsulates the desperation and paranoia that are the first season's centerpieces. Not typically included as one of the series' best episodes, Rapture is mentioned here almost entirely for the performances of Grace Park and Tahmoh Penikett. 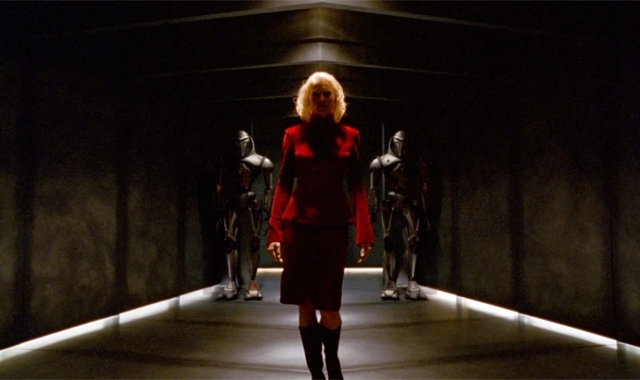 While the episode's major plotline is structured around the relationship problems among the crew during a rescue mission, Helo and Sharon's desperate attempt to rescue their daughter from the Cylons has some of the series’ best scenes, particularly with respect to how Sharon gets aboard the Cylon vessel. Battlestar, at its core, is about defining what it means to have a soul. This episode explores the concepts of parental love and the power of trust, two of the cornerstones of humanity. Arguably one of the greatest introductory experiences in television history, the miniseries that kicked off the reboot remains solid to this day. It takes its time introducing the audience to all of the various characters while simultaneously rebuilding its universe. One of the many strengths of the show is in its dichotomy. On one end of the spectrum, Battlestar is a war story; filled with soldiers, commanders, and scenes of sacrifice and heroism. On the other side is a story about faith, family, and the mysteries of creation. Religion and mythology pervade virtually every aspect of the show and their origins within the initial episodes is expertly woven into the apocalyptic setup. The controversial series finale has divided fans from the second the credits rolled. Many fans felt cheated by the surprise/no surprise conclusion, similar to Lost. However, upon deeper examination, the finale does many things surprisingly well. First, the audience is treated to one of the most exhilarating combat sequences of the series. The rescue mission for Hera is outstanding, featuring a redeeming moment for Boomer and the infamous resolution to the Opera house vision plotline. While things devolve quickly in the final act, the buildup is crafted extraordinarily well. Ultimately, this episode is polarizing due to its summation of the entire saga, however, those interested more in the mythology behind the curtain will find many things to enjoy upon revisit. Also, Doc Cottle's first name (Sherman) is revealed! Perhaps the most intense episodes of the entire series, the conclusion of Admiral Cain's storyline has to be seen to be believed. The most striking feature of this two-parter is the different leadership styles of Cain and Adama. 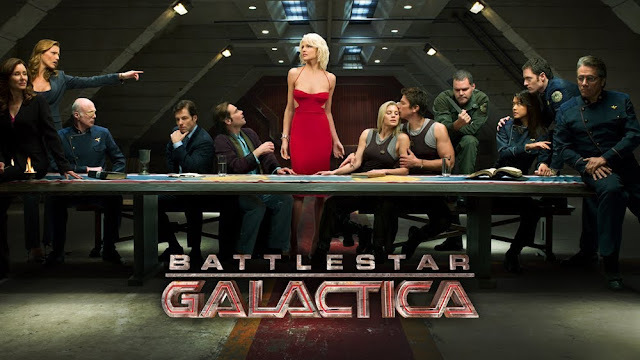 It is through this conflict that the major themes of Battlestar are explored. Military/Police action versus government intervention. The will of the people versus the safety and survival of the species. The humane treatment of prisoners and what it means to have a soul. 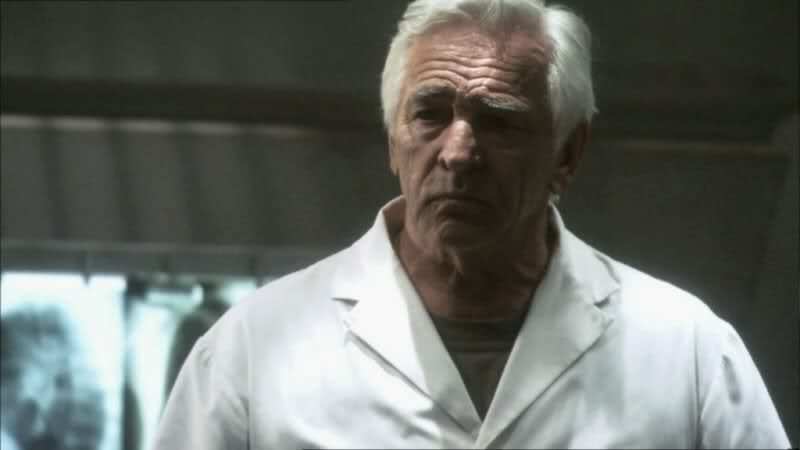 The thrilling cliffhanger is jaw dropping, however, Adama's "orders" to Starbuck are unforgettable. While Cain's fate is decidedly abruptly, the comeuppance and ultimate impact of her story ripples throughout the remaining seasons. These two episodes are the main event. Filled with terse action, heartbreaking revelations, and some of the best acting of the entire series, the mutiny plotline is amazing because it reveals the flaws of Roslin and Adama’s leadership. Are Gaeta and Zarek wrong? Does it matter? Battlestar has always been a show about doing what is right and following one's conscious. The mutiny plotline is the direct result of when two competing visions come into conflict and the results are gripping. The episode also features Laura Roslin's greatest speech; a diehard condemnation of the actions of the mutineers that will give any loyal fan chills. Finally, one of the most powerful aspects of the episodes is a grim reminder that old vendettas die hard and, despite progress and mutual respect, the divide between humans and Cylons may ultimately be what undoes the fleet. Told through flashbacks and a ritualistic boxing competition, Unfinished Business explores the growing relationship between Roslin and Adama, Starbuck and Apollo's ill-fated romance, and the guilt that the crew harbors over the New Caprica occupation. This is a stunning episode (in a lackluster season) that features some of the best camerawork of the series, particularly during the final confrontation. Edward James Olmos gives the performance of a lifetime in this episode, taking Adama through a kaleidoscope of emotions. 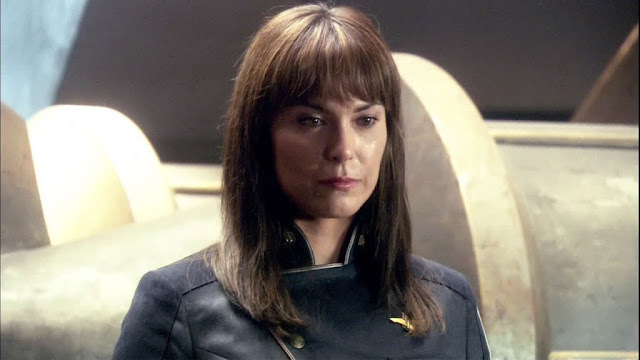 This is also an episode with almost no Cylon presence and it is focused almost entirely on the drama between the crew. One of Battlestar's many exceptional qualities is how it handles relationships: They're human, complicated, messy, and almost always unresolved without slipping into cheap melodrama, and this episode is an excellent showcase of the masterful writing and acting that contributed to the Peabody Award winning show's legacy.